Don’t get me wrong. I love my Android smartphone and tablet. They’re great for getting things done on the go, like checking my email, browsing the web, or updating my Facebook account. Even so, it’s usually faster and more comfortable to do those kinds of tasks on a regular old computer with a real keyboard and mouse. No matter how hard I try, I just can’t type as quickly on a small touchscreen keyboard. Managing files is easier with the conventional drag-and-drop interface too. So, what can you do when you want to do those kinds ofÂ conveniencesÂ on your Android device? There’s an app that provides exactly that kind of functionanlity. It’s called AirDroid, and it allows you to “wirelessly manage your Android from your favorite browser.” You don’t even need to install any software on the PC, because it’s all done from a web-based interface. The core idea here is actually really robust. 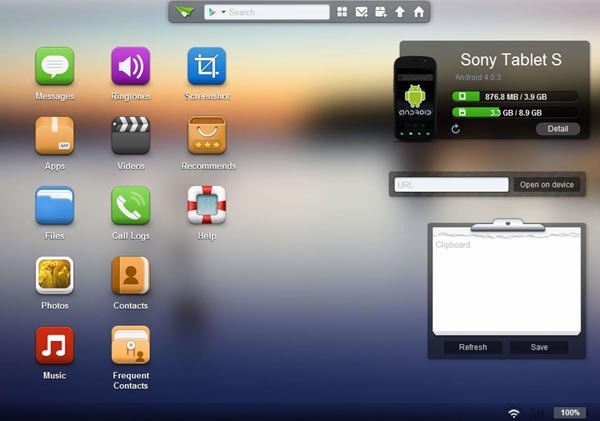 While you don’t get complete control over your Android device and you won’t be able to play your Android games on your computer screen just yet, you are able to do a heck of a lot with AirDroid that you would normally do… clumsily… directly on your Android device itself. The major shortcoming, if you can call it that, is that both your computer and your Android device have to be connected to the same Wi-Fi network for this app to work. Given that, all you have to do is download, install, and open the AirDroid app from the Google Play Store. You’ll then see the screen above. On your computer, you go to the associated website and it will ask you for a passcode. This is displayed on the main page of the Android app as seven-character code. Alternatively, you can scan the QR code that is displayed on the website using the camera on your Android phone or tablet. I found entering the passcode to be faster, but that’s up to you. On your Android device, you’ll find another tab called “Tools” that lists a series of tools available within the app. These include checking on your network, managing your files, and monitoring your data usage. 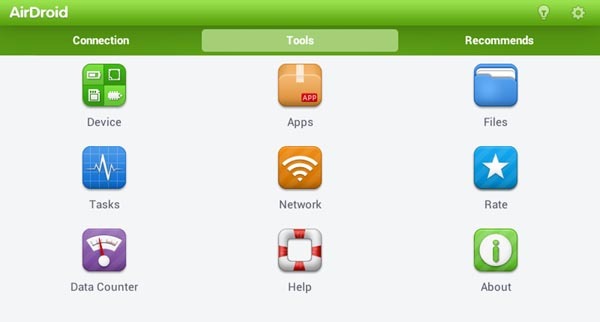 You probably won’t use these all that much, but they’re not the main part of AirDroid anyhow. The main part happens on your PC. After you’ve linked your Android device with the web browser on your PC, you are treated to quite the visually appealing web interface. It looks almost like an Android home screen in many ways. Along the left side are a series of apps where you can interact with your Android device wirelessly. At the top is a search bar along with some quick icons and along the right are some widget-like interfaces for seeing how much storage capacity you’re using, what version of Android you’re running, and so on. There’s also a clipboard to keep notes if you’d like. This is all very clean, very easy to follow, and very easy on the eyes. If you understand how to navigate through the apps on your phone or tablet, you’ll understand how to use this web UI. As mentioned, each of those icons on the left is effectively a web app that works with your mobile device, but some of these are restricted to rooted devices. For example, you can’t take a screenshot of your Android phone or tablet (using the AirDroid web UI) unless it is rooted. For the most part, it really is like having full control of your Android smartphone or tablet right on your computer. There’s an icon at the top for sending a message, for example, including the ability to read past conversations. I don’t know about you, but typing out a message on a real keyboard is a heck of a lot faster than typing on a touchscreen. You can also sift through your call logs and contact lists, including a list of frequent contacts. The best part is that your friends and colleagues won’t even know that you’re texting them from a computer, because it’ll show up at their end as just regular old SMS. What’s more, many of the “apps” within AirDroid are almost as robust as full-blown desktop counterparts. A simple example of this is the Photos app shown above. I can see each of the different folder groups that I would normally see under the “Gallery” app on my tablet, but I also get to simultaneously see the content of that folder as a series of thumbnails. I can multi-select to download or upload content too. When I opened the “Music” app in AirDroid, I was expecting a similar file-manager-like configuration, but there’s more to it. You can actually stream your music directly from your Android device through this web-based interface. It’s not the most powerful media player in the world, but it is seamless and it works. The same is true with video content. I have both my Android phone and my Android tablet set up to automatically upload all my camera photos to my Dropbox, but what about all the other files that I want to move back and forth? 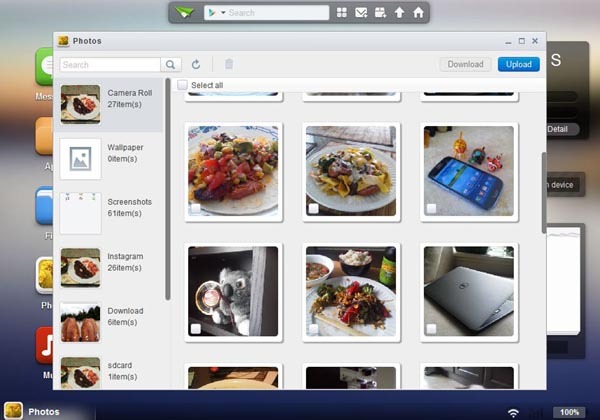 AirDroid provides a wireless file transfer protocol that’s simple yet powerful. The desktop SMS management is fantastic, giving an IM-like interface complete with a searchable list of contacts. I can even organize and play my different media files through the web interface, which is certainly easier to do on a computer than it is through even the best Android file manager app. Considering that AirDroid is a free download from the Google Play Store, there really is no reason why you shouldn’t get this app. It won’t be all that useful when you’re on the go, but when you’re staying put at home or at the office for a little while, AirDroid makes it a lot easier to fully control, manage and manipulate your Android device from the comfort of a full computer and web browser.